Montserrat has had various modes of access since it lost Bramble’s Airport to a pyroclastic flow in 1997. Helicopter and ferry were in daily use right up to 2005 when the new Airport at Geralds was opened. The most common route for travelers outside of the region is to fly to the nearest international airport situated on our neighbouring island, Antigua, then take a pleasant 20 minute flight by an ‘island hopper’ plane directly to Montserrat. A ferry service is again available. 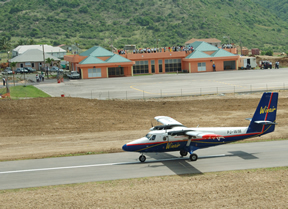 Introduced in December 2009, this service provides connections between Antigua and Montserrat. Up to date information on prices and schedule can be found on the web site of the Montserrat Tourist Board. Ferry Schedule – Travellers coming to Montserrat during the Christmas season will benefit from an extended ferry service to the island from Antigua. The service will operate on December 1th, 5th, 6th, 7th, 8th and then from December 10th to January 12th, 2013. * Please note that these trips take 2 hoursThe fare is EC$300 return (EC$150 one way) for adults and EC$150 return for children under 12 years. The Montserrat Tourist Board’s web site www.visitmontserrat.com provides more detailed information on travelling to Montserrat.